Shane Warne is an Australian cricket legend whose life reads like a soap opera. He was the first cricketer to take 700 Test wickets, including a hat trick, won the Man of the Match award in a World Cup final and is the subject of seven books to date. He also holds the unenviable record of scoring the most number of runs without a Test hundred. Perhaps Shane’s very best accomplishments were kept for the back end of his career. In 2004, after returning from a 12-month hiatus, he took 26 Sri Lankan wickets in three Tests. The following year he took 96 Test wickets in the calendar year, 24 more than his previous best, with 40 being English scalps taken in the thrilling Ashes series. Shane retired at the end of the 2006/07 summer after the Australians reclaimed the Ashes urn. 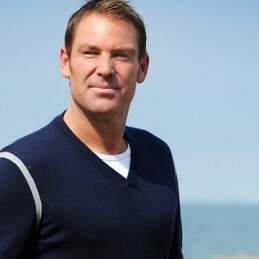 There is no bigger draw card in Australian sport than Shane Warne.